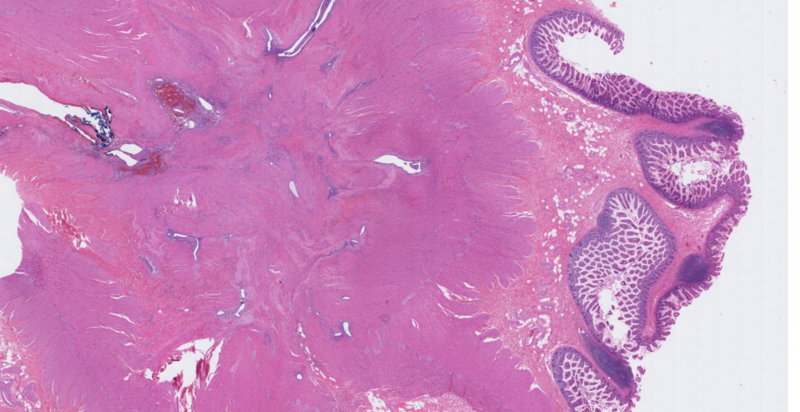 Histology: This resection specimen contains a section of small bowel notable for irregularly arranged glands involving the serosal surface and muscularis propria of the bowel wall. The individual glands are lined by low cuboidal to columnar cells with uniform nuclei and no atypia. Many of the glands contain pale pink intraluminal secretions. Some glands have associated periglandular stroma comprised of bland spindled cells with associated chronic inflammatory cells, including hemosiderin-laden macrophages. There are associated extravasated red blood cells within this periglandular stroma. There is no surface dysplasia of the bowel mucosa. Discussion: This patient’s obstructing colon mass is due to florid endometriosis resulting in large and small bowel adhesions and strictures. The individual glands are comprised of bland, cuboidal to columnar cells, which can be occasionally ciliated. The cells can variably appear proliferative, secretory or hyperplastic in response to the hormonal stimulus of the patient’s menstrual cycle. 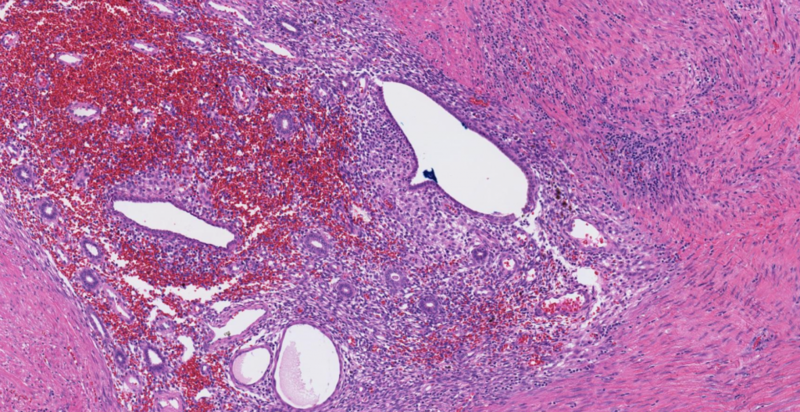 The glands are characteristically surrounded by endometrial-type stroma, consisting of small, blue wavy cells that may show hemosiderin deposition and hemosiderin-laden macrophages due to bleeding. The differential diagnosis and diagnostic pitfall is invasive adenocarcinoma, whether of colonic or endometrial origin. 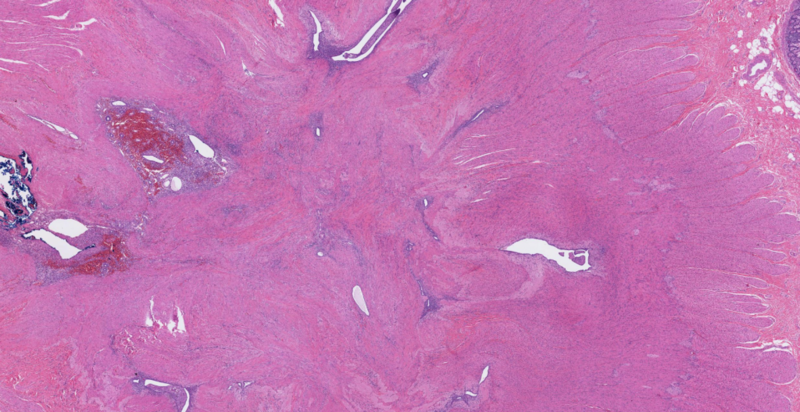 In cases of florid endometriosis, it is important to evaluate for the presence of complex or atypical hyperplasia; rarely, clear cell carcinoma can arise within endometriosis particularly endometriomas. 2.Clement PB. The pathology of endometriosis: a survey of the many faces of a common disease emphasizing diagnostic pitfalls and unusual and newly appreciated aspects. Adv Anat Pathol. 2007 Jul;14(4):241-60.